Where are you sending friends now? Where can I take my 13-year-old to sample New York’s best food without breaking the bank? 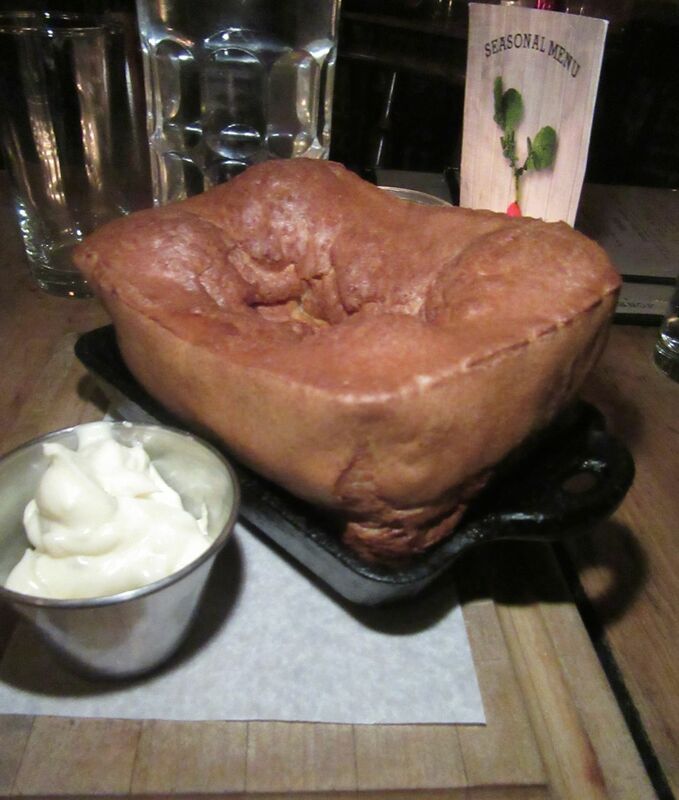 Jones Wood Foundry’s warm Yorkshire pudding popover with Stilton dip keeps us busy till starters arrive. 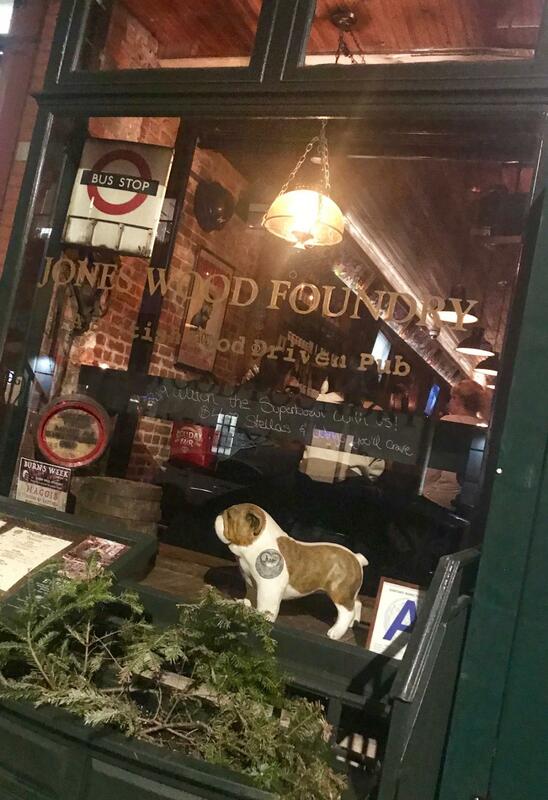 After a thrilling lifetime that has totally ignored Robert Burns, I find myself seduced by the idea of a haggis homage at Jones Wood Foundry, an Upper East Side pub. My friend Shelley Clark, the seven-year-old house’s publicity flack, asked me to tweet about the Scottish ritual Haggis, Neeps and Tatties (offal with oats, rutabaga, and mashed potatoes.) I decided I wanted to eat it. 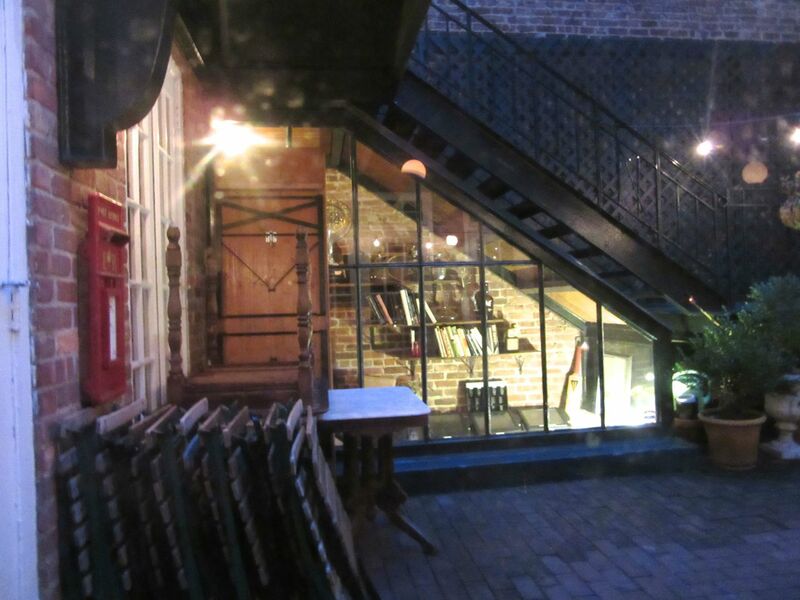 The 1860’s one-time foundry is full of flea market and attic finds. How many things are wrong in the previous sentence? 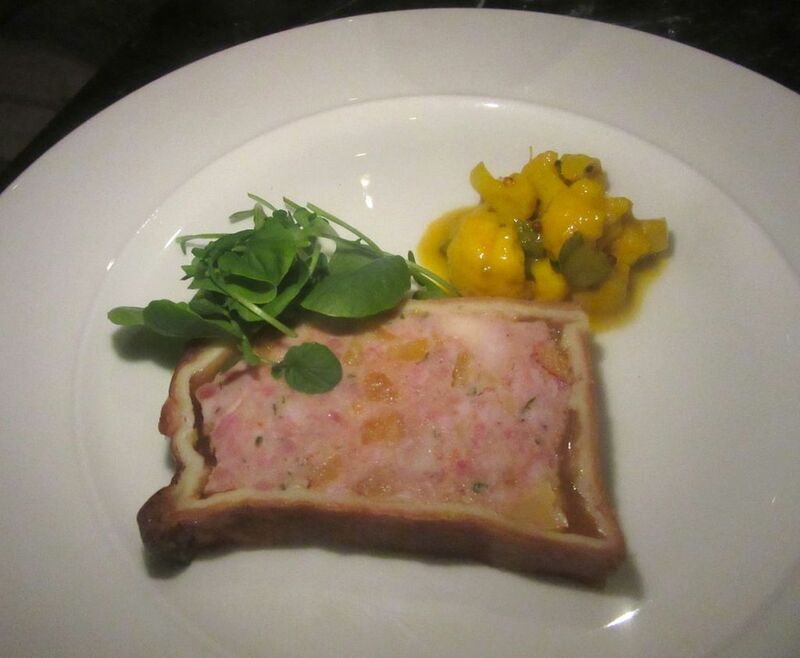 Obviously, it’s not proper for restaurant critics to hang out with restaurant publicists. Certainly not to see each other weekly at dinner, certainly for goodness sake, not at a client’s table where the shared check might be reduced by her discount. And the dreaded haggis? The dog in the window of Jones Wood Foundry stops us on the street before we enter. 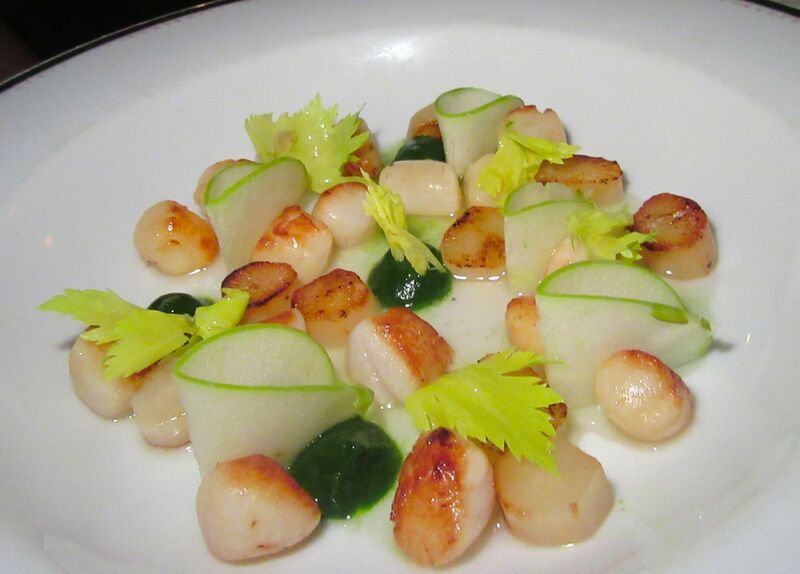 Clark has been a restaurant booster for years, once exclusively for Warner LeRoy. But only recently did we get to be plate-passing pals. I’d actually sneaked into Jones Wood once before without letting her know when she touted their shepherd’s pie to me for a tweet. The door opens into a circa 1860s building that was once a foundry that made manhole covers. And there actually was a Jones Wood before it became the zipcode we know. 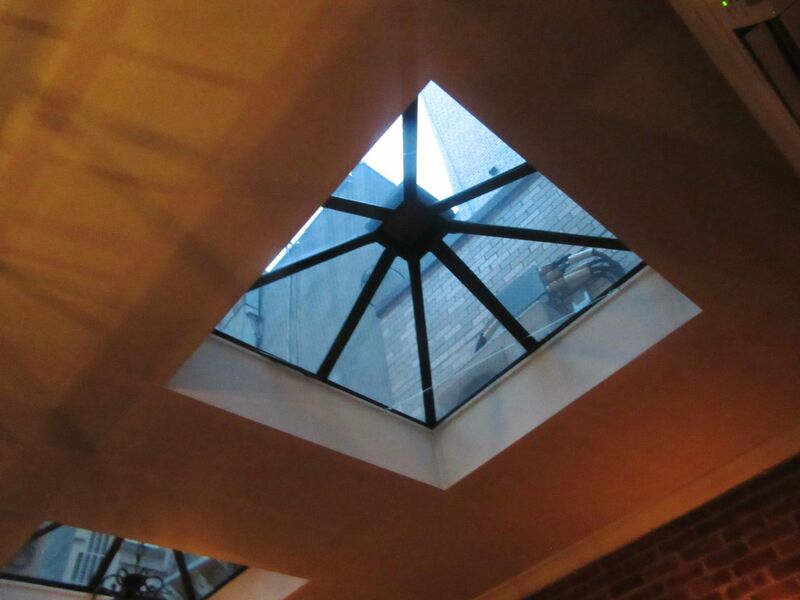 My favorite table is in the room with Victorian pyramid ceilings. 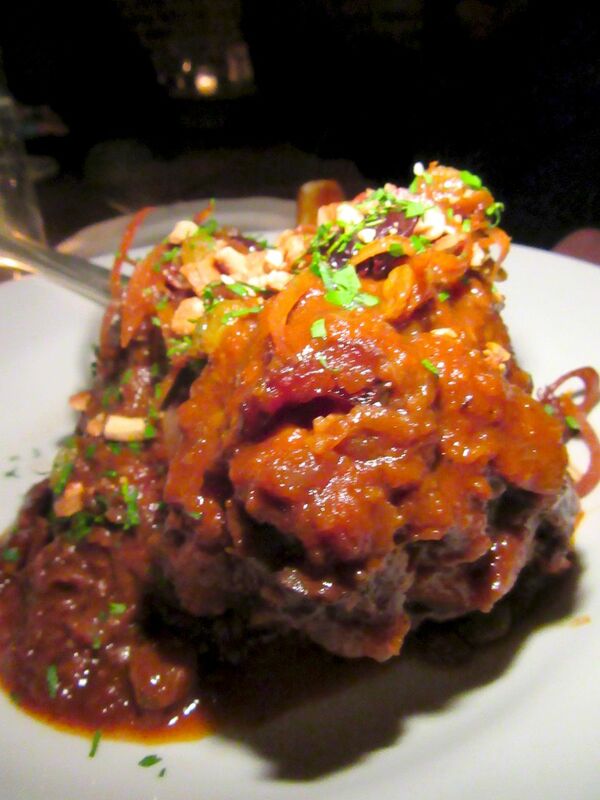 We’ve already eaten more than too much when the vindaloo lamb shank arrives. 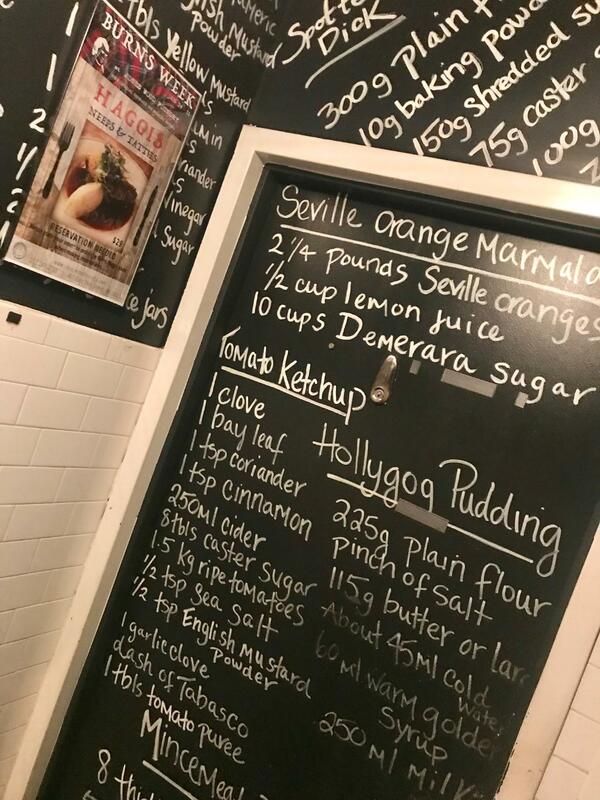 The place draws mostly young locals to a mix of flea market finds: the bulldog in the front window, votive candles burning on a wrought-iron chandelier, vintage photographs and coffee pots, antique toys and mirrors on red brick walls, an open courtyard and Victorian pyramid skylights. The middle room looks out at the garden and across the way to a room that leads downstairs. 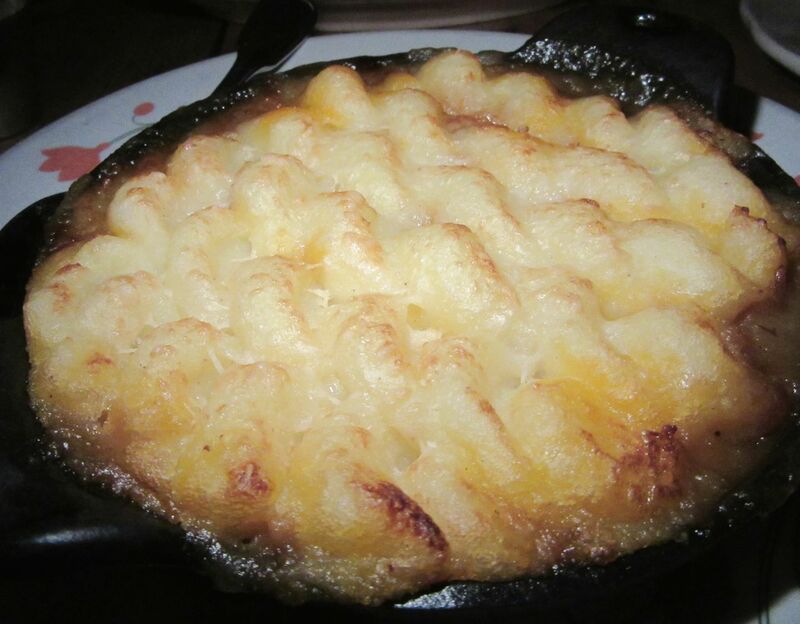 Lamb shepherd’s pie wears a mantel of mashed potatoes glazed under the grill. 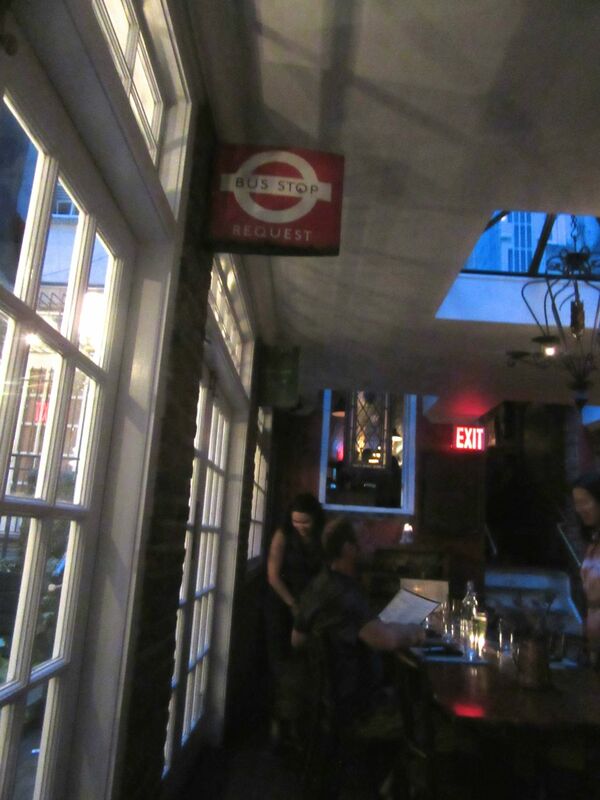 Three of us pushed through the crowded bar that first fall evening for barbecued pork terrine, shepherd’s pie and toffee pudding. I liked the quiet corner table looking out into the garden. The service was attentive enough most of the evening until a noisy party filled up a nearby table and we ceased to exist. As the evening darkens so does the courtyard outside our dining area. 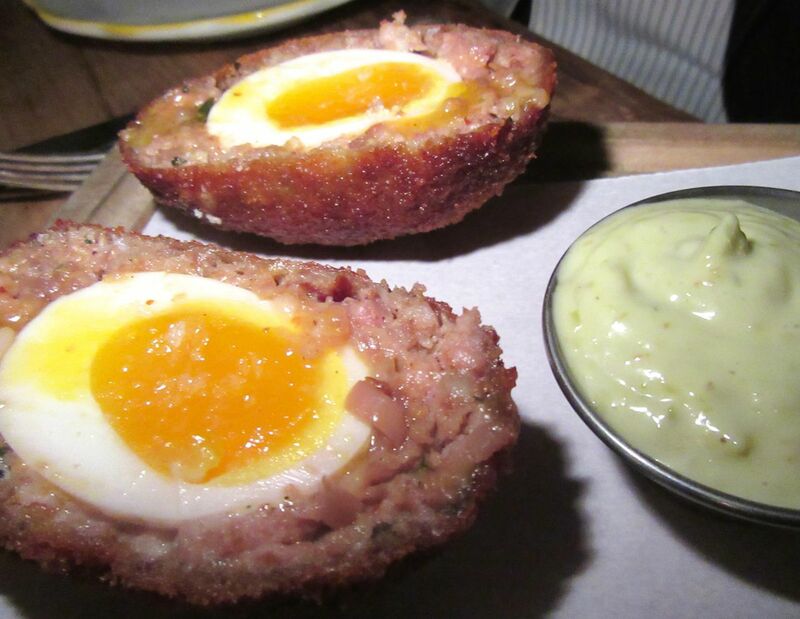 The Scotch egg is a deliciously custardy, wrapped in sausage, rolled in breadcrumbs and fried. As long as the oxtail pappardelle remains on the menu, I consider it a must to share. 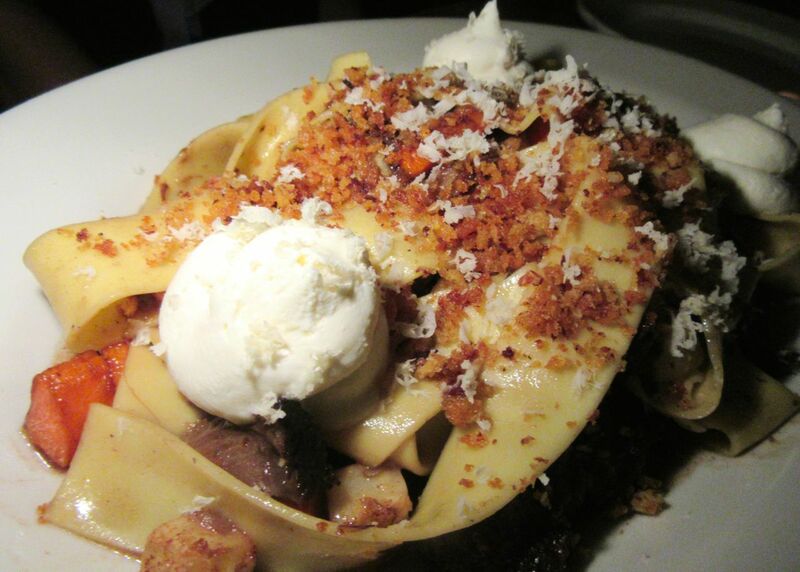 As advertised, the oxtail pappardelle dotted with root vegetables, horseradish, swirls of ricotta and garlic crumbs -- rich and savory -- is enough for two or three. It’s a special from the Seasonal menu, a collaboration between Chef-partner Jason Hicks and his executive chef, Cornwell-born Arjula Bull. The pasta has been so popular in January that the house will repeat it in the February Seasonal listing. It’s the excess of butter that makes the minty peas taste so good. 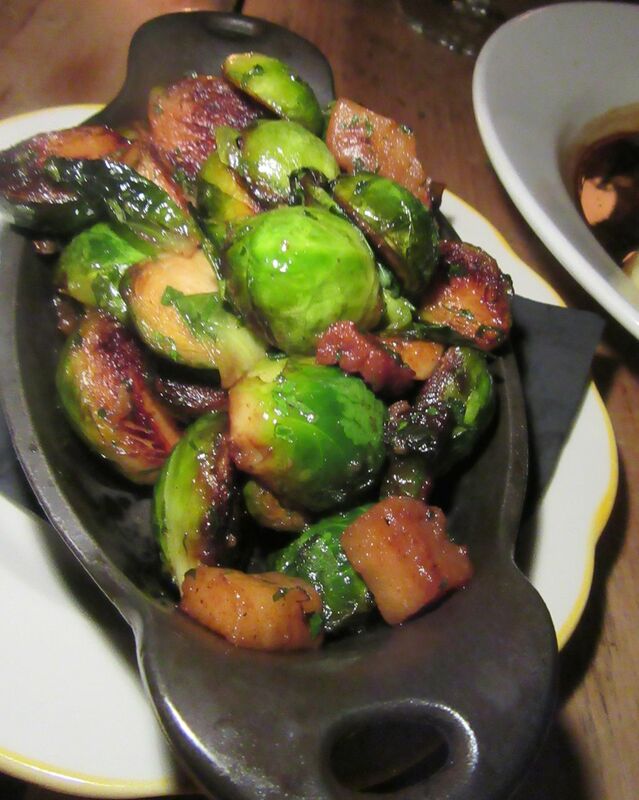 Perfectly cooked Brussels sprouts -- neither tough nor wimpy -- are tossed with bacon lardons and apple. Hicks’ emphasis on British classics doesn’t seem to allow for serious salads, so we get our greenery from $8 sides -- minted mushy peas and roasted brussels sprouts with bacon and apple. “The best I ever had,” says Dana. I begin to realize my enthusiasm is not about a vintage aura and the neighborhood crowd. It’s about the food. It’s good. I decide to return the next evening with a friend who’s bringing a couple I’ve never met. He’s been everywhere and is into cannabis. She’s French. Her mother was a food writer. A rash choice, perhaps, but I can’t write this piece until I taste more dishes. 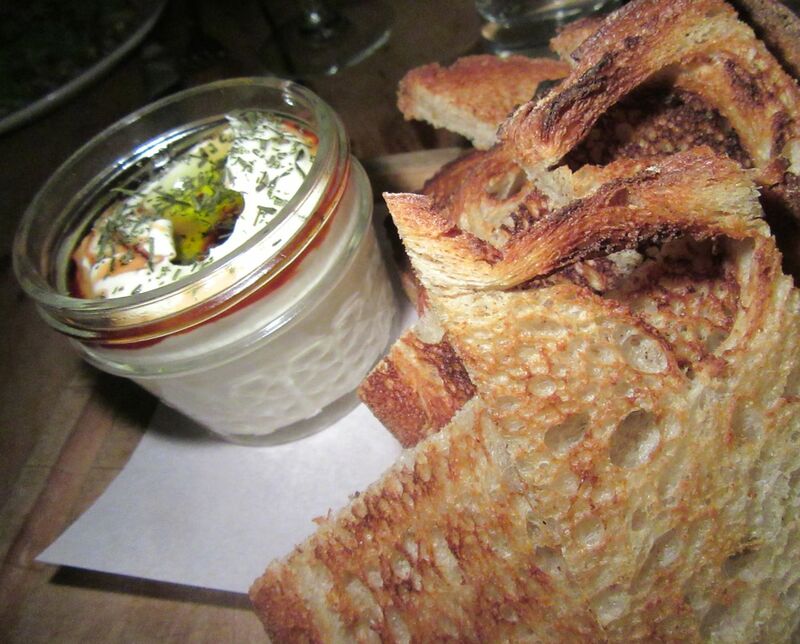 The kitchen sends out honey whipped ricotta with to pile on slices of sourdough toast. 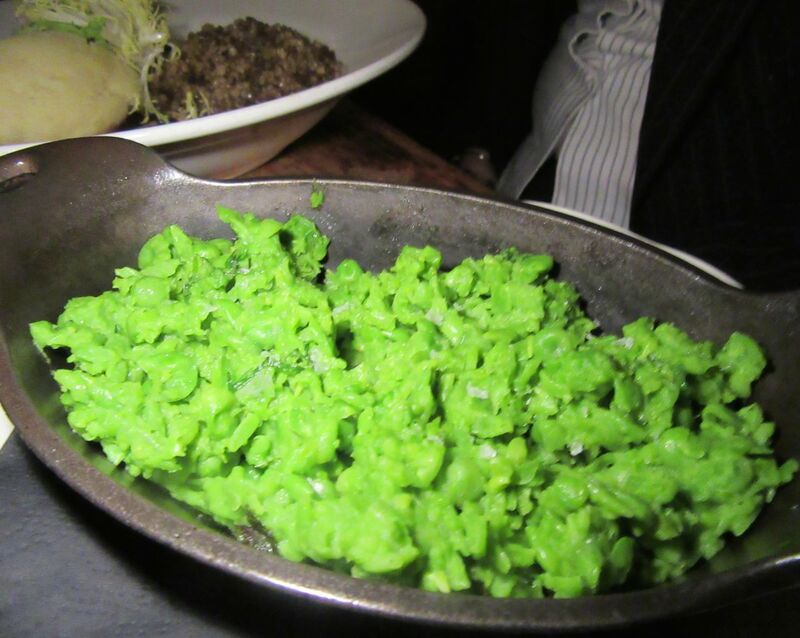 My companions ask to order the asparagus gribiche. 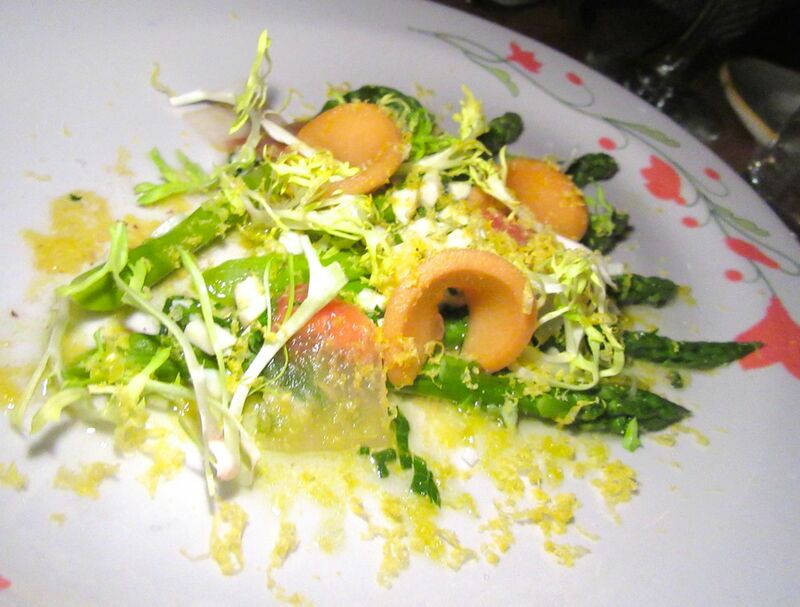 Asparagus in January? I keep my mouth shut. I have to convince them they don’t want scallops and oxtail pappardelle. 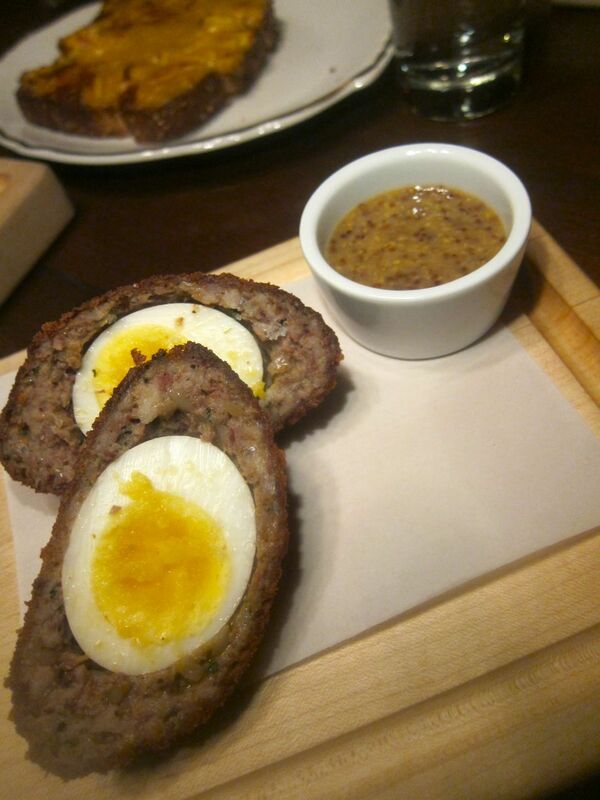 I let them have the Scotch egg because how mean can I be? The house sends out homemade ricotta sweetened with honey to spread on thick toasted sourdough. By the time we’ve finished the popover, the runny yolk in its crispy bunting, and the asparagus gribiche, my companions are raving about the food too. 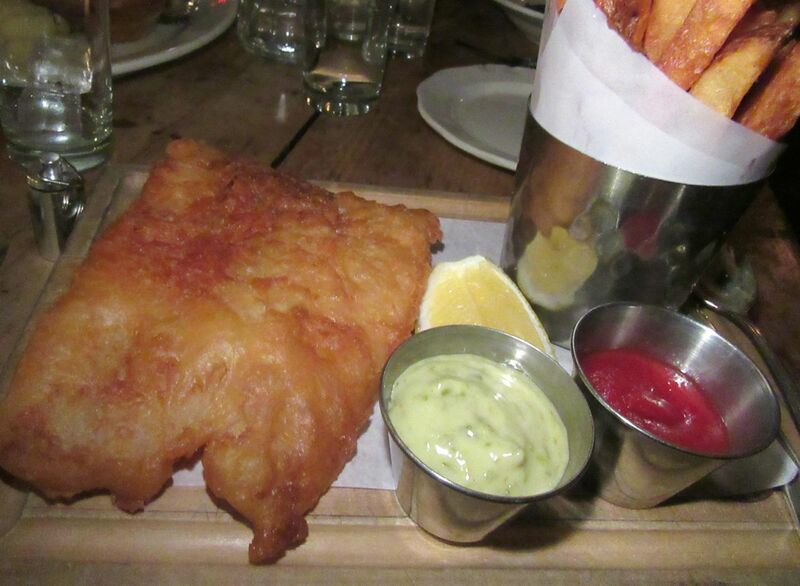 I can’t remember ever tasting fish and chips with fresher and crispier cod. I’ll want this again. Have I ever had better fish and chips? Beer-battered cod is stunningly fresh, exquisitely crisp, and perfectly cooked and paired with fine triple-fried potatoes. 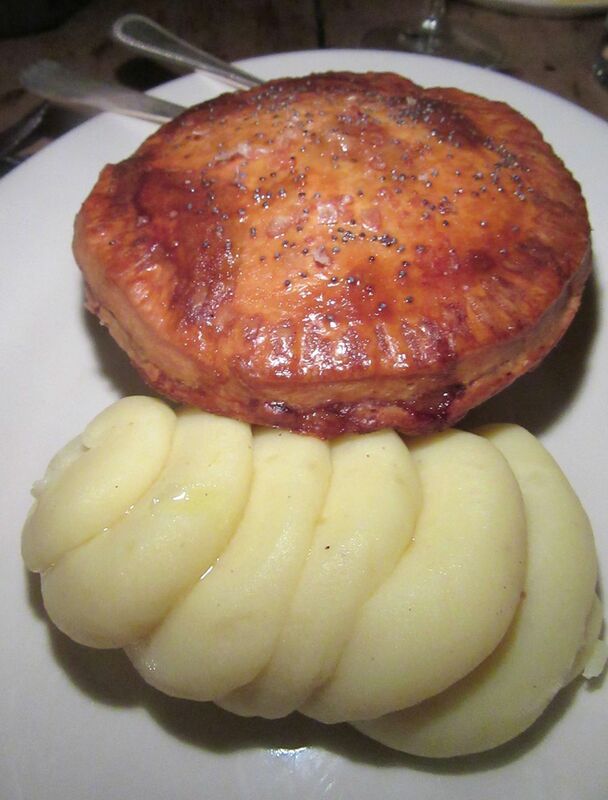 The pie of the day, pheasant with celery root and anise, comes wrapped in a buttery puff pastry top and a veal kidney suet bottom, with creamy mashed potatoes riding alongside. We can barely make a dent in the tender lamb shank vindaloo, a mammoth roast with raisins, cashews, citrus chutney and a side of basmati rice. I leave with the leftovers for my Sunday dinner. 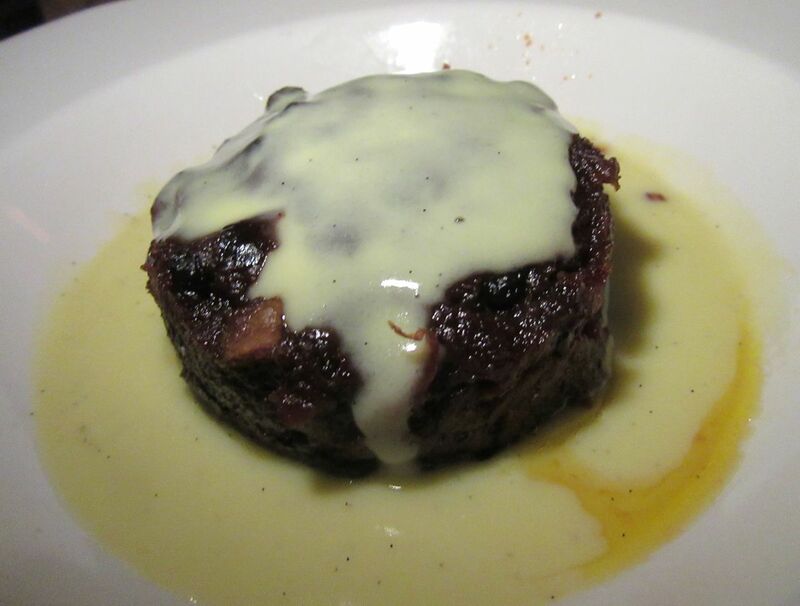 Warm plum pudding fondant sits in a puddle of coconut-rum cream. For those who must have chocolate – the milk chocolate tart – from a Hick’s family recipe. Nobody really wants dessert but I point out that English sweets are part of the story. Warm plum pudding fondant sits in a coconut-rum puddle. 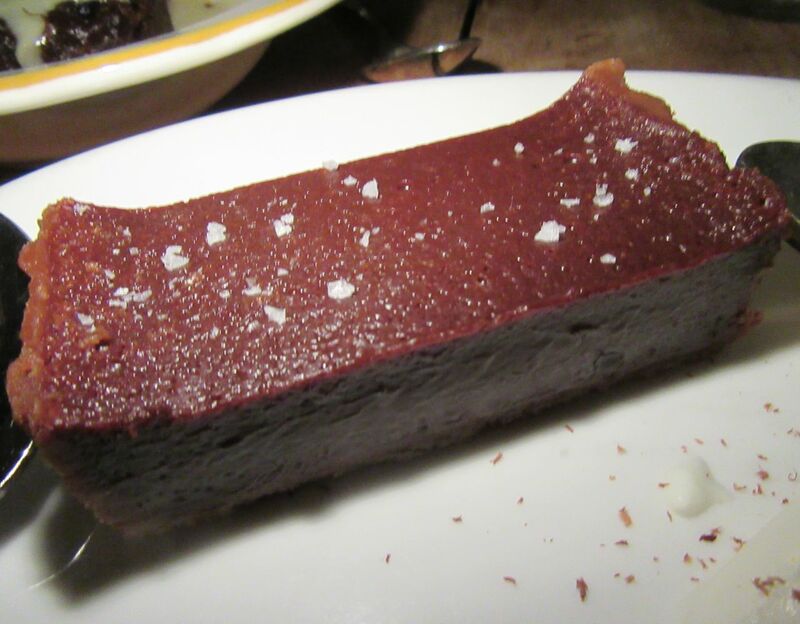 The milk chocolate tart is perfect for those who can’t end the day without chocolate. 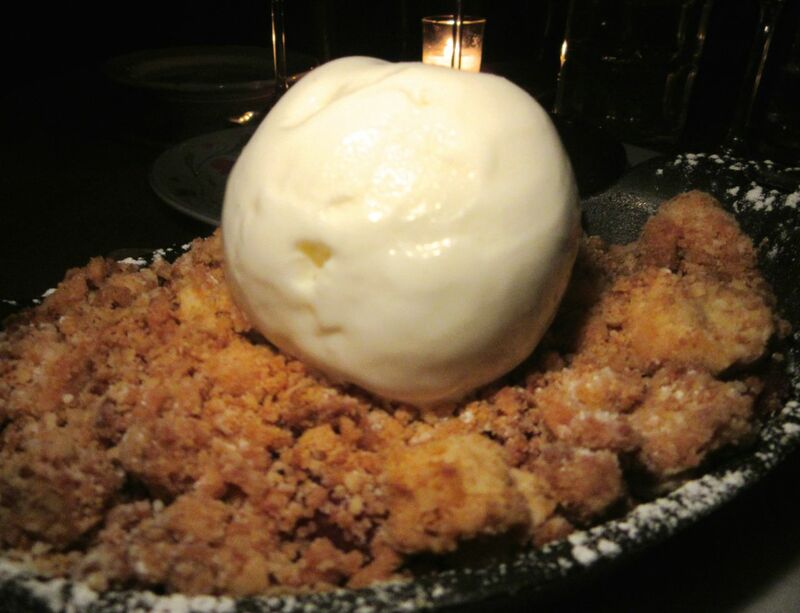 The crumble might be apples and cranberries in fall or berries or stone fruit in summer. 401 East 76th Street between First and York. 212 249 2700. Lunch Monday to Friday noon to 3 pm, Dinner Monday through Friday 5 pm to 11 pm. Saturday and Sunday 6 pm to 11 pm. Brunch Saturday and Sunday 11 am to 4 pm. Bar, Monday through Thursday 5 pm to 1 am, Friday till 2 am, Saturday noon to 2 am, Sunday noon to 1 am. Copyright © Gael Greene 1970 to 2019. All Rights Reserved. Words may not be downloaded for reprint or sale without permission from copyright holder Gael Greene. All of the color photographs on this site are by Steven Richter, Gael Greene or Dana Stoddard and are protected by copyright.